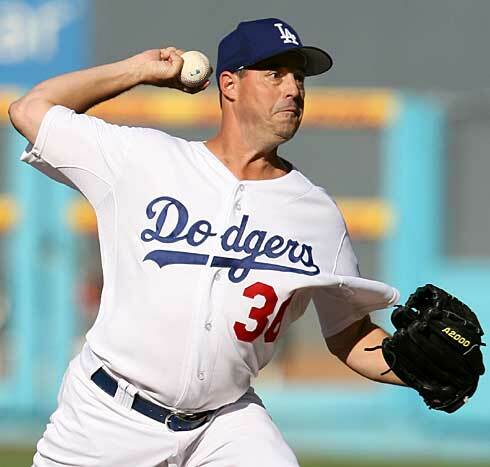 The San Diego Padres have reportedly traded RHP Greg Maddux to the Los Angeles Dodgers. The deal is as yet unofficial, and no terms have been announced, though it's expected that the Padres will receive one or two mid-level prospects (i.e. not much). Maddux has gotten only 3.99 runs/game from the Pads, on average, which is 48th among the 53 NL pitchers who have thrown at least 120 innings so far this year. He's had 11 Quality Starts this year in which he's gotten either a loss (5 of them) or a no-decision. The Padres simply don't score runs, being second to last in the majors with 3.82/game. The Dodgers aren't much better (they're 24th in MLB, with 4.25 R/G) but they can probably get him a few wins. And what difference they can't make in run scoring should be accomplished with the bullpen. The Dodgers' relief corps has a 3.02 collective ERA, second in the majors, while San Diego is 23rd, at 4.23, and that despite playing half their games in an extreme pitchers' park. If Maddux can continue to provide 6 or 7 quality innings - and really, he's already 42 and there's no evidence that he can't - the Dodgers should only need to score 4 runs or so and then Maddux can turn it over to Beimel and Park and Kuo and Co.
Maddux may not be the innings leader he once was, but he's still an innings eater. He's LAIM at best these days, but that's still pretty valuable, especially to a team that may be trying to save a young pitcher's arm, as ESPN's Rob Neyer suggests. He was among the NL top 10 in Innings Pitched every year from 1988-2001, and 2003-05. He also tossed 199.3, 210, and 198 innings in the other three years, good for the top 20 in the league each time, and is 18th in the NL this year. Maddux rarely gives you much more than about 6 IP, but he gives you six decent innings, and anyway, these days a guy who can amass 180 IP with a league average ERA is pretty valuable. Maddux has a full no trade clause in his contract, but he agreed to waive it for this deal, something I doubt he would have done if they'd wanted to trade him to, say, Arizona, where he's 1-7 with a 6.01 ERA for his career. He's smart enough to know that staying in places like LA and SD toward the end of his career, i.e. severe pitchers' parks in a league with less offense, will only help to maintain his impressive legacy by keeping his ERA down. His 3.99 ERA in SD this year would have been more like 4.38 in a neutral park, 4.89 in a place like Philly, according to http://www.baseball-reference.com/. You think there would be much call next year for a 43-year old pitcher with a record of 8-12 and a 4.90 ERA? Yeah, neither does Greg. Smartest Pitcher Who Ever Lived, indeed. Keeping his ERA in that cozy 4.00 neighborhood keeps his options open to come back next year if he wants, as his stats, at least on the surface, make him look like he's still an effective commodity. And that's crucial if he wants to move up in the record books. With two more wins this year he'll pass Roger Clemens for 8th place on the all time list, and don't think Maddux isn't aware of that. If he can win just four of his remaining eight or nine starts this season, Maddux would be sitting at 357 Wins, within striking distance of Kid Nichols at 361, Warren Spahn at 363, and also Pud Galvin at 364. That would leave only Christy Mathewson, Pete Alexander, Walter Johnson and Cy-Freaking-Young ahead of him on the list. Galvin and Nichols both pitched in the 1800's, and regularly racked up 400, 500, even 600+ innings in a season, against a league that was brand new and inexperienced, where the home run champ for the season was frequently in the single digits. Maddux' accomplishments, against the best players from around the world, with world-class training regimens, dieticians, and - yes, I'll say it - steroids at their disposal, stand head and shoulders above the men he could pass. He just wants the chance to prove it.